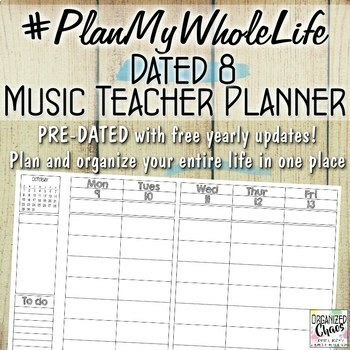 This planner and binder bundle is the ultimate music teacher organizing and planning toolkit for the 2019-2020 school year and beyond!! Everything comes in Powerpoint format so you can add your own text, or delete and move pages, before printing. And best of all: FREE UPDATES each year! The planner will be updated each year to reflect the new dates, so you will never have to purchase another planner again! 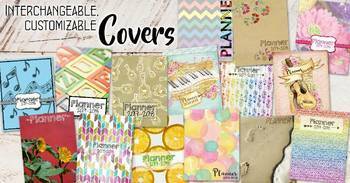 Please watch this video to get an overview of all the features and pages in this planner and see all of the planner options available in my store! Not sure which lesson planning format is best for you? Watch this video to help you find the best one for your needs. The weekly lesson planning pages in this version are designed to maximize lesson planning space. Only weekdays are included, with each week covering a 2-page spread. 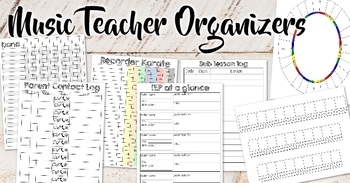 There are 8 lesson planning blocks and space to note other important events and prep work each day, and a to-do list and notes section each week. This is an ink-friendly version with full-color covers and primarily black-and-white inside pages. For a full color version of this planner, click here. Printing and personalizing tips, including links and tutorials to download the fonts used in this product for free, are included as well. Get more tips for printing / setting up your planner, and my favorite planner supplies, in my blog post on planner setup. Get tips on digitally customizing your planner before printing in my video tutorial on customizing in powerpoint. 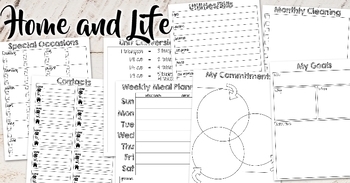 See how I've set up my planner in my video tour of my Entire Life Planner! ★ Follow my store to stay up-to-date on new products and get special offers!